With the Republic of Singapore Air Force's 2011 Open House done and dusted, it is time for the After Action Reviews, which I am sure the Open House Organizing Committee would be carrying out (or have carried out) in the weeks since the show. I am sure that other aspects of the show would have been reviewed in excruciating detail so I shall skip those bits and look at the show from a perspective close to my heart: that of aviation photography. As with every RSAF Open House, at least one of every type of the RSAF's current locally-based flying inventory was on public display. A nice touch was the appearance of KC-130B 724 on the static display, sporting artwork commemorating 30 Years of 122 Sqn's C-130 operations from 1980-2010. However, a glaring omission was F-5T Tiger II 855, the now-famous Tiger Stripes 30th Anniversary aircraft, which is still yet to make its first public appearance since the scheme was first applied in 2009. While I understand that a two year-old paint job might look a bit worse for wear, but from a personal point of view, I'd prefer a worn Tiger Stripes making its appearance than not at all. I just hope that the scheme would be able to see the light of day to the public, in some form, in the future. The other exception was perhaps the E-2C Hawkeye, which according to the 111 Sqn G550 crew, are still on limited flying duties. If that were the case, the Hawkeye's absence from the Open House would represent another omission for what would have been a complete RSAF aircraft lineup. 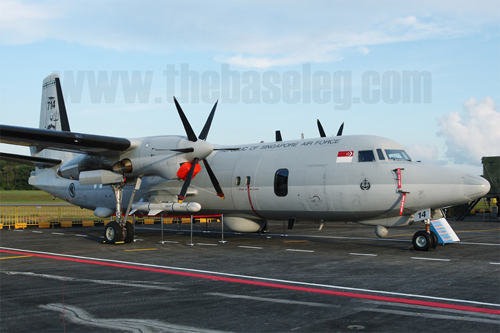 There will almost certainly be no other chances for the E-2 to be on display at an Open House, with the Gulfstream CAEWs surely approaching Final Operating Capability meaning the retirement of the venerable Hawkeye would come soon. The presence of so many types/sub-types, however, did not result in better photographic opportunities for aviation photographers. While the move to introduce boarding ladders on both sides of static display aircraft to facilitate a higher number of visitors to the cockpits, it also meant that clear, unobstructed photos of the aircraft were impossible to acquire, regardless of how thin (to use the term loosely) the crowd was even if one made the dash into the show at the start. What was left to properly photograph were the F-15SG, F-16D Advanced Block 52 and AH-64D Longbow Apache set aside for the arming demonstrations, as the crowd barriers set far enough away from the subject aircraft without necessitating the use of ultra-wide angle lenses (such as the Canon 10-22mm). The orientation of the aircraft also did not help matters. With noses pointed westwards, front quarter photos of the aircraft (the bread-and-butter aircraft shots) could only be achieved under the late afternoon sun. While that was not a problem (for the larger aircraft with no ladders in the way) during the Bloggers' Preview I was kindly invited to before the show, it was another problem to contend with during the Open House public days, although truth be told, with the sun hardly making an appearance throughout the weekend of the Open House, this point was pretty much moot this year. Suggestion for the next Open House: Set aside 2 hours one afternoon, eg. 4-6pm on the preview days before the public days, to declare a Spotter's/Photographer's Happy Hour, where the static display aircraft will be fenced off, ladders, engine intake/exhaust covers and even Remove Before Flight tags removed, for photographers to get clean photographs of the RSAF's aircraft inventory at readiness. You know it makes sense. As has been noted elsewhere, the Aerial Display at the RSAF has been sticking to a tried and tested formula since literally the last century (I believe 1998 was the first time a variation of the theme was used); a quartet of RSAF fighters being scrambled to intercept unidentified bogey(s) approaching Singapore airspace, a mock dogfight/forced-landing of intruder, followed by a tactical display involving RSAF helicopters supporting army operations with helicopter gunships and fighter-bombers simulating close air support of ground forces. While amply demonstrating the RSAF's capabilities, the routine does need spicing up in case it becomes, well, routine. One more point to note: The final F-15/F-16 formation flyby and break for landing was almost directly over the grandstand. This resulted in mostly belly shots with the exception of the banking aircraft. It would be better, from a photography standpoint, to have the aircraft do their flyby slightly to the east of Runway 02 to facilitate more side-on photographic opportunities. Suggestion for next Open House: 1) Reintroduce a handling display by a frontline type, such as the F-15/F-16, in addition to the usual air defence/tactical display. Quick-burn flares release would help improve the thrill factor of the handling and tactical displays. 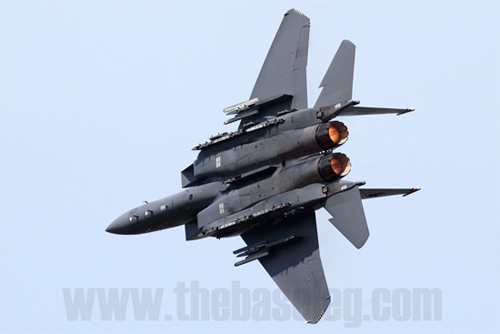 2) Have formation/solo flybys by each of the RSAF's types. A flightpath parallel, and slightly to the east of Runway 02 by each aircraft with an early break in front of the grandstand will provide spectators plenty of photo opportunities particularly in the afternoon sun, while giving the aircraft plenty of room to avoid foreign airspace. I've heard 2013 being bandied about as the year for the retirement of the RSAF's F-5S/T Tiger II fleet. If true, and if the RSAF were to hold it's next Open House that year (it's 45th Anniversary), it would represent the swansong of the RSAF's Tiger IIs. My dream scenario would be to see some of the fleet done up in retro schemes from the 1980s, from the RSAF's standard Northrop Aggressor Grey scheme from the 80s, and hopefully extended to the SE Asia, Archipelago Blue and Silver special schemes from the time. And of course, an updated Tiger Stripes scheme for the retirement would really be the icing on the cake. I know it will cost a fair bit, and it is certainly not in keeping with the RSAF's norms, but I can certainly hope, can't I? At the very least, the Tiger II, if not retired by then, should play a big part in it's final Open House. 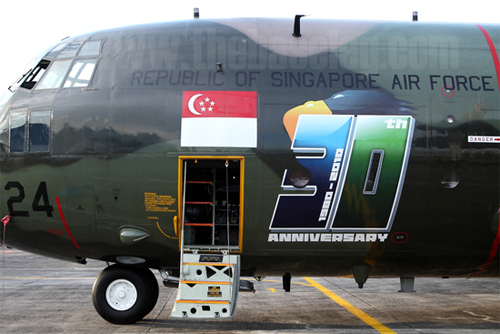 And there should be one, if not more aircraft done up in a special scheme to commemorate the occasion. The arrival of the F-5 to Singapore's shores in 1979 was historic as it marked the first supersonic aircraft in the RSAF's inventory, and the first time one of our frontline aircraft was purchased new, instead of being hand-me-downs from other air arms. It's retirement should be commemorated with a big occasion. 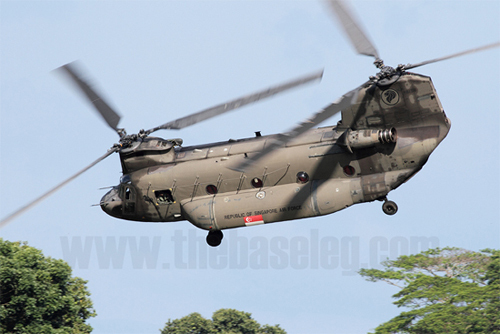 I have had the pleasure of visiting the Royal International Air Tattoo in England, as well as airshows in Thailand, Malaysia and Australia, and would not hesitate to say that the RSAF Open House stacks up very well against these. It is obvious that successive Open House Organizing Committees make the effort to improve the logistics and execution of their respective Open Houses, and I recognize those efforts. A big shout out also to the Singapore Ministry of Defence's Public Affairs Directorate, in conjunction with the 2011 Open House Organizing Committee, for inviting local bloggers for a preview before the actual event. And finally, to the men and women of the RSAF, without whom the Open House would not have been possible. I say thank you, to all of you.